It has become predictable, with every approaching holiday, the green blogosphere erupts in eco-advice. Recently, I have received several emails asking for suggestions on how to reduce waste during this sometimes glutinous holiday. All the shopping bags, gift wrapping, decorating, etc. adds up to a tremendous amounts of packaging waste, which makes it challenging to reduce, reuse, and recycle. 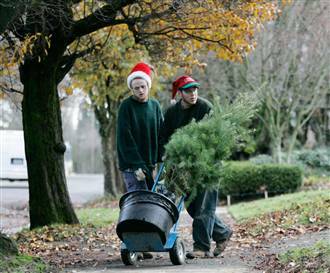 Here are a few suggestions for greening your Christmas celebrations. These suggestions also apply to other winter holidays. Wrap Presents in Fabric and Forgo the Box: If you feel the need to wrap presents, which does create some wonder in children’s eyes, try wrapping presents in fabric. Fabric is reusable and less likely to be tossed in a landfill after the presents are opened. You can find less expensive fabric that has already been cut into “fat quarters” at fabric stores, as well as thrift stores. Left over fabric wrapping “paper” is great for later kid crafts and quilting. Furthermore, if offered a box from a retailer to place your present in before wrapping, decline this extra packaging. The more we reduce, the less waste we create. Decorate a Live Christmas Tree: Every holiday season, I find it disturbing to see lot after lot of cut down trees. Many of these trees go to waste, and even those that come home with families end up in incinerators or landfills. The alternative is to buy a potted tree or, as my family has done in the past, dig one up in the forest (not sure if this is illegal on public lands). We take advantage of live Christmas tree shopping to buy a new tree for our land. I often shop native plant nurseries to find the perfect species to replant after the holidays. According to LiveEarth.org, “A single tree can absorb more than one ton of CO2 over its lifetime.” If you don’t have room on your property for a tree or you rent your home, you can plant your tree in a friend’s yard or a national forest (along as you chose a native species). Click here for tips on caring for a live Christmas tree. Live trees can be expensive, and there is even a company that rents live trees to families for the holidays. I am pretty adamant about not killing trees for the holidays, even if they are farm-raised or from a plantation that needs thinning. In fact, when my daughter’s school cut down trees to sell for a fundraiser last year, I refused to let her participate. Ship Directly From Online and Catalog retailers: If you make purchases online or from catalogs, chose to ship the presents directly to the receiver. By shipping them directly, you will save money by not having to ship the gift twice (once to you, and once to the receiver). The money saved can be used to purchase gift wrapping from the retailer, if you feel that is necessary. Furthermore, you will reduce your carbon footprint for the holiday by not having your gifts be transported twice. If you must ship packages, use US Postal Service Priority Mail or Express Mail packaging. These USPS packaging materials “have been awarded Cradle to Cradle(SM) Certification for their environmental attributes. The Postal Service is committed to finding new ways to protect the environment and is the first in its industry to receive this certification.” At least our government is doing one thing right. Decorate with Homemade Items and Hand-Me-Down Ornaments: One year, one of my students gave me the most beautiful garland made of strung madrone berries. Ten years later, it still decorates my tree, and my daughter has started a tradition of creating her own madrone berry garland every year. She gathers the berries, which fall this time of year, then uses a needle and thread to string them. They dry on the string. Kristen Chase, of Cool Mom Picks and the League of Maternal Justice suggests using cranberries or the traditional popcorn for decorations. Speaking of Kristen, have you seen Cool Mom Picks Safer Toy Guide? It puts our Green Kids Holiday Gift Guide to shame. Kristen also asked the question about lighting. It is true that LED Christmas lights are the most eco-friendly option; however, if you already have lights, I am not sure it is warranted to buy new ones until they break. Since I live-off-the-grid, it is not an issue for me, but I am curious to know what our readers think: Should you get new LED lights or use the ones that you already have? In addition to lighting, when decorating your house or tree, ask relatives for extra ornaments they no longer use. Our collection of ornaments has come from grandparents, great grandparents, parents, etc. Sometimes it feels like our tree is an homage to my childhood, but this also makes it special. Buy Gifts That Count: We all have people on our lists we feel obligated to buy a gift for who really doesn’t need anything. These can be the challenging gifts to buy, and often, these gifts end up in second hand stores or landfills. To meet the challenge, think about giving gifts that count, such as carbon credits from TerraPass or a charitable gift to Heifer International. Also, think of ways to give gifts without spending money, such as promising special time together out of your busy life with a loved one. I hope these ideas help you have a greener Christmas, Solstice, Hanukkah, or Kwanzaa. Every little bit counts! For more ideas on greening your holiday, such as using old Christmas cards for gift tags, visit Family Fun. We have the great debate about a christmas tree every year. We have compromised with a small live tree for the past few years. Unfortunately, they tend to just survive the holiday. So this year, I’m going to be vigilant in my tree care, so thanks for the tips. In our family we often don’t wrap some gifts, which makes the display around the tree that much mroe exciting on Christmas morning. But I love the idea of fabric wrapping. I have several yards of fabric that I was wondering what to do with…no I know! I would also suggest that sending e-greetings instead of paper cards would be a good green option for the holidays- save trees and the many costs of transporting the cards from here to there. Great suggestions Nicole. E-cards are great. We always use them for birthday invites. There is a website called Global Gifts that has bio-plastic gift cards that are loaded so individuals receiving them can go back to the website and choose the charity they would like to give their money to. You can also use canvas shopping bags to wrap gifts – great for grocery shopping in the new year. There is a great company called Bring Your Own Bag BYOB that makes fashionable ones that would be a great present. I love the idea of using canvas shopping bags to wrap presents! It is a great way to make the wrapping reusable and drop subtle hints on loved ones about their shopping habits. How about not giving gifts this Christmas and having fun with family? That’ll reduce the waste by a lot. Those are some interesting ideas. I wish live trees were available locally. LOL The last time I had a live tree, it was this little mini thing I picked up at the local super market. It kept falling over, and the needles were super scratchy. It’s still guarding my mother’s front door, where we planted the next spring. It never has gotten very big, and I’m not sure what it really was. Now, we just use a fake tree. I just finished making giftbags from beautiful Christmas fabrics I bought at one of Jo Ann’s cool sales. I’m so sick of the huge paper mess from packaging every year. We’ll still have some paper mess because of gifts given to us from other friends and family, but we’re getting there. As for our gift giving, it’s always very small. The children each get three gifts: an article of clothing (usually something homemade by me such as flannel pj’s or a knit sweater), a book, and a toy. Their stockings have an orange, and apple, a bag of nuts, and a bag of chocolate coins. Since this is the season of giving, we give even more to the community than we usually do. We always take several tags from the giving tree at our Church, we spend more time at the shelters (human and fur baby alike), etc. And what few gifts I don’t buy local, I order from http://gearthatgives.com/ I was unable to get out and do much shopping this season because the kids have been super sick so I bought almost everything in one shot. In the end, I also funded over 400 cups of food. And, I got beautiful fair trade items that aren’t full of liscensed characters, plastics and excess packaging. Dig the blog a LOT! Nice style and I like the way you discuss the problems . I’m going to book mark it. I love all of your ideas, I wonder how you feel about fake trees. I know the impact of the plastic is big but would it help by not cutting down and using a real tree every year?